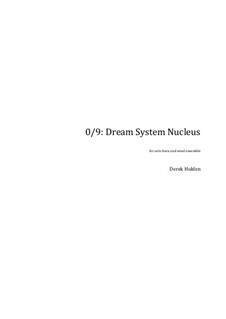 0/9: Dream System Nucleus (read as “zero of nine”) for solo horn and chamber wind ensemble serves the purpose of introduction in more than one regard. The piece is designed to be the introduction to an evening of music, but also exists as a prelude to a series of nine additional pieces that have yet to be written, each revolving around one of nine locations in which my dreams have taken place for about a decade. This piece serves as the space between those locations. Relatively brief in duration, the work gives the soloist ample opportunity to display their virtuosity and musicality at the highest level, all within the framework of a uniquely orchestrated chamber wind group.